Somewhere beyond the circle of money, glitz, drugs and controversy that characterizes professional sports in America, there exists the remnants of the ideal. In Iowa, that ideal survives in the form of high school wrestling, a way of transforming the local virtues—modesty, privation, hard work—into sporting glory. To be a wrestling champion in Iowa is to achieve greatness—individual glory where the only back to pat is your own. For Jay Borschel and Dan LeClere, though, the stakes have been raised. Already three-time state champions in differing weight classes, each boy has a chance in his senior year of high school to do something historic—to become a “four-timer,” joining the most elite group in the sport and essentially ensuring his status as an Iowa wrestling deity. For Jay, a ferocious competitor who feeds off criticism and doubt, a victory would mean vindication over the great mass of skeptics waiting for him to fail. Dan, the kid from a farm near the tiny town of Coggon (population 710), carries other burdens. For his community, for the hard-driving coach who doubles as his father, and for his own triumph over his personal demons, another title is the only acceptable outcome. As the two boys approach the finals in a series of increasingly tense and hard-fought matches, Jay and Dan reveal the forces that drive young men through a grueling routine of early-morning and late-night workouts, social isolation, and starvation diets—and the rewards of the wrestling life. But in the finals, a victory is the only answer; blow that chance at a fourth title, before the fanatical crowds at the giant state tournament in Des Moines, and you will be little noted nor long remembered. 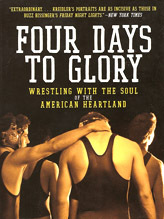 Four Days to Glory is the story of America as told through its small towns and their connection to sport, the way it was once routinely perceived—a way of mattering to the folks next door.